[Wed 1 December, 1993] Today was largely uneventful, consisting mainly of a bus trip from Delphi to Patras. It was again a lovely day, and I spent the majority of the morning sitting in the sun waiting for H, who was trying to ring home with no success. The bus trip began most pleasantly, winding down the mountainside towards Amfisa and Itea. The hills and mountains extended all the way to the coast, and were almost totally devoid of trees. As the bus from Itea to Patras wound further and further along the coast to the west, Delphi, Hrisso and Itea were visible as sprawling masses of white buildings clinging to the mountainside. It was sad to leave Delphi, since I had for so long wanted to go there, but I am glad I have seen it now. The bus trip started off okay, but after we detoured off the main road at least six or seven times to pick up or deposit members of different villages, it became tedious. It took over four hours to reach Patras, by which time we were tired and extremely irritable. We trudged down to the youth hostel — which is a HOLE — where we dumped packs and went off in search of dinner. We had a delicious Greek pizza. The evening was spent conversing with two Australian girls who are in the midst of a huge grand tour. Sometimes I think it’s the only way to see everything and I really want to see everything! There are seven of us in this little dorm room tonight — squashy. [Thurs 2 December, 1993] This morning we left Patras at 9:30 am, stopped off for coffee, then found the train station and bought tickets for Olympia. The train journey to Pyrgos was cramped and long and tedious and included a 20 min stop in the midst of nowhere. Grrr. Pyrgos to Olympia was much shorter (~10 km in ~30 min) and so here we are. We conveniently found the youth hostel sign-posted and what’s more OPEN. After a dinner of chips and Greek salad (and an encounter with a dodgy jewellery store owner), we wandered down the road towards the ruins for a sneak preview. They are stunning and I can’t wait until tomorrow! We went down a dirt road and then down a river bed to come out behind, and those pillars in the setting sun were amazing and wonderful. From the tourist bureau we picked up a brochure on the Peloponnese and it seems there are lots more ruins that we have not heard of. So planning what to do next will be a dilemma!! What a joyous time I am having! 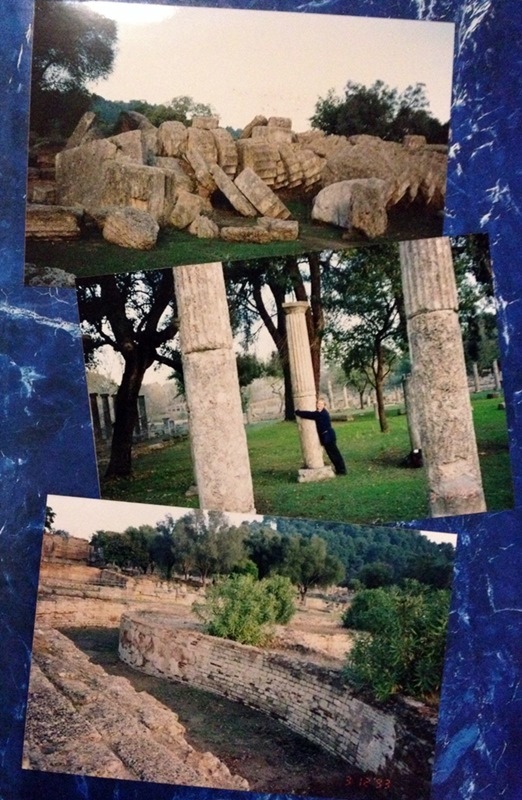 Ancient Olympia: top – fallen column from Temple of Zeus; middle – hugging a column in the Palaestra; bottom – the Leonidian. [Friday 3 December, 1993] Olympia is beautiful. In order to see the site, the museum, and the Olympic museum by 3:00 pm when they all shut, we were at ancient Olympia by 8:30 am. Thus the shadows were long, and the ruins blended into the landscape as a part of it. It is a very tree-covered site – green and grey mingled together, as old and unchangeable as my predilection for coffee and chocolate. Both of us liked the palaestra — or wrestling school — best, in my case probably because it had the most pillars, situated in concentric squares surrounding a large patch of very green grass. But all of Olympia is lovely, and we again had delightful weather. It was another photofest I’m afraid, but then who cares? I also splurged and bought a book on the Peloponnese — lovely pictures of lots of places. There are lots of books on Delphi but I’ve managed to restrain myself. The museum of Olympia was also brilliant, consisting mainly of statues, frescos, cauldron decorations and armour! I think it’s best to see the site first so that all the parts can more easily be placed. The two great fresco-things (statues really) from the Temple of Zeus at Olympia were simply breathtaking. Olympia was an unexpected highlight of Greece. 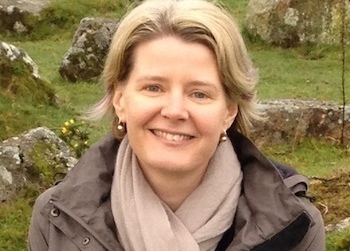 I’d been so focused on Delphi, that Olympia’s serene beauty took my breath away. Have you ever discovered a hidden treasure while travelling? I imagine it would have been hard to resist buying books at every stop, though hauling them around would have been a problem! I wouldn’t have missed this trip for the world. Still hankering to go back there! BTW – Is that you hugging the column in the photo above? And, yes, that is me hugging the column. One of these days I might be brave enough to show a close-up – heh. Your journal entries were very engaging. Did you see everything you wanted to 20 years ago? I think it must be about time to plan your grand GRAND tour!